Nothing in print says "elegance" like foil stamping, but what exactly is it? Foil stamping, hot stamping or hot foil stamping is the application of pigmented or metallic foil to paper using pressure and a heated die. The die presses the foil onto the surface under pressure, leaving the design of the die on the paper. Foil stamping, or foil printing is frequently combined with embossing to produce a three-dimensional image. You've likely seen this effect on holiday cards, wedding invitations and certificates. There are so many ways to use foil stamping to set your print apart from the crowd. There are many types of foil that can make your printed piece pop. Holographic Foils use the transfer of a hologram image onto unique foils. Holographic foils add a dramatic effect that often provides a "high-tech" look. Scratch-Off Foils cover and hide things that can be revealed by scratching, creating truly interactive print. Greater brand perception: Research shows that by adding gold foil printing or other interesting effects to your piece, consumers perceive a higher value and quality of your product. Attention-grabbing effects: Foil stamping helps make your printed piece stand out from the crowd with its distinctive and eye-catching appeal. Foil can be applied to most paper stocks. However, the ideal paper stock for metallic foil or other foil stamps is gloss cover or other stocks with a smooth surface. Linen or other textured papers can be a challenge for foil due to their uneven surfaces, as the foil may not look as crisp. Business cards, brochures, presentation folders, greeting cards, note cards or invitations are some of the endless possibilities that you can foil stamp. Add a touch of class to your marketing materials with elegant and affordable foil stamping. Because of the extensive setup involved, a minimum quantity of 250 pieces is required. Request our custom printing effects sample to see examples of these effects first-hand. 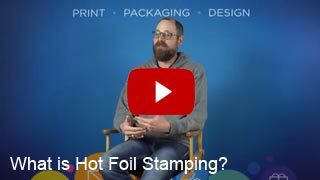 Need creative or technical advice on using foil stamping on your next printing project? Give our print experts a call at 800-930-2423, or Get Pricing.